He argues that the creation of a co-operative tenure for housing in Britain, distinct from both individual owner occupation and from tenancy—whether from private or social landlord—is urgently needed now, as are the proposals for financing a co-operative housing sector. 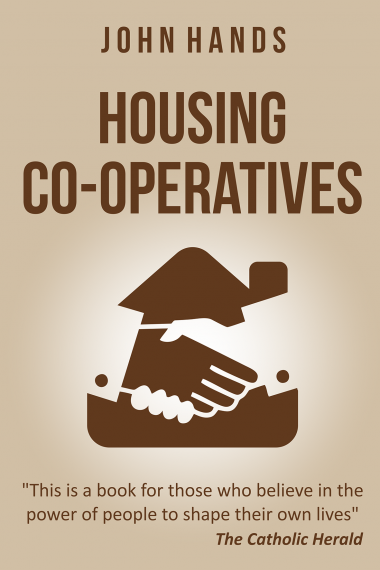 A housing co-operative provides residents with all the benefits of ownership in terms of control and decision-making, but it is housing for use, not property for investment. As a result the housing becomes relatively cheaper over time. This is a book for those who believe in the power of people to shape their own lives. Shock, horror, drama. A new book is out about housing which says it’s all about people and not about social engineering or investing for your old age…it’s by John Hands who has actually succeeded in doing what he’s talking about, which is to set up co-operative housing schemes that actually work. John Hands’ timely and exemplary guide is marvellous…this is a book for all concerned with the role of and effects of housing in this society of ours. A most powerful mixture of common sense and idealism, a practical man’s gospel and a visionary’s handbook…this is a book intended to influence events here and now. His book is the most comprehensive account we have of co-operative principles applied to housing, the experience of other countries, and the possibilities…John Hands’ book is going to be indispensable. [John Hands] shows how housing co-ops could offer, in the immediate future, a valuable alternative form of social ownership in housing, enabling people to collectively own and control one of their fundamental human rights—housing—on the basis of mutual aid rather than individual gain or distant bureaucracy. The strengths and pitfalls of a co-operative framework for housing are made admirably clear. A unique mixture, thorough and practically written by a person who has spent the last seven years working full-time in developing and managing housing co-operatives… One feels that a penetrating mind has been brought to bear on the subject and the book will be of great use not only to both professionals and tenants but also to anyone who cares about one of the common ills of today—the alienation and loneliness of individuals in modern urban society. Housing managers will find the book not only a valuable and interesting source of practical information about housing co-operatives, but also stimulating and provocative in its penetrating observations on recent housing policies and on social and community problems besetting modern urban society. The importance of this book is that it not only states clearly what needs to be done but goes on to discuss in detail how it is to be done… This is a book to study and discuss. The major contribution his book should make to what we call the British Co-operative Movement should be one of challenge and stimulation. John Hands has recently published an important book on housing co-operatives in which he surveys his experiences and findings…he does not shrink from employing a critical yardstick to housing co-operatives in other countries and outlines his views about the practical action to be taken in present and future circumstances.